Here’s a scary fact. In 2015, the National Center for Health Statistics reported that the age group of 75 to 84 accounted for a high number of suicides. The National Institute of Mental Health reported the risk of suicide was highest for people over the age of 65. Mental Health America said 18.6 percent of all 2013 suicides were committed by those 85 or older. There are several reasons why seniors commit suicide. Some are diagnosed with chronic conditions, such as Alzheimer’s, and lose hope. Isolation and loneliness that goes on and on can lead to depression. Chemical imbalances are other reasons seniors may consider suicide. How Serious is Depression in the Elderly? 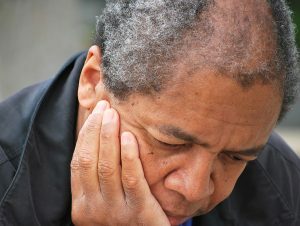 Depression is a mental heath condition that affects as many as 65 million men and women aged 65 or older (National Alliance on Mental Illness – NAMI) The risk is highest for seniors who need home care or are hospitalized. Chronic conditions, such as cardiovascular disease, often lead to depression, but so can a lack of mobility and isolation. Left untreated, depression may affect cognitive function or lead to physical illness. It can lead to feelings of hopelessness. As a result, some seniors may feel trapped and attempt or succeed in ending their life. NAMI reports that 70 percent of those who commit suicide usually have seen a doctor a month prior, but the doctor failed to diagnose depression. You may need to fight to make sure your parent’s symptoms are not easily dismissed. What Should You Do If You’re Worried? Key signs of depression include sleeping longer, withdrawing from activities that used to be enjoyed, appetite changes, mood changes, exhaustion, and problems focusing. Depression can also manifest through physical pain that does not improve with treatment and bouts of insomnia. If you’ve noticed your mom or dad showing any of those signs, seek a medical professional’s input. Depression can be treated with medications, physical activity, and therapeutic services. Again, if the doctor dismisses it as a normal reaction to a chronic condition or aging, seek a second opinion. Make sure your mom or dad has ample opportunity to be social. Create a schedule so that someone stops by to spend time with your parent on a regular basis. Get siblings, grandchildren, and family friends involved. If you can’t drive your parent to social functions at senior centers or area businesses, hire a caregiver. Senior care providers offer transportation services and companionship. If you or an aging loved one are considering senior care in Middletown, NJ, please contact the caring staff at Lares Home Care 888-492-3538 or 732-566-1112.